Good Nutrition is difficult to master, so we’ve listed 10 of the most frequently asked questions and answers to nutrition questions written in an easy to understand format. We’ve also included 5 nutrition tips on things you should know and easy ways to eat a nutritious diet. 1. How are “liquid calories” and “solid calories” different? Liquid calories are not as satisfying as solid calories, so we tend to drink more fluid calories to stay “full”. Which results in us taking in a larger amount of calories. Studies suggest that drinking liquid calories causes weight gain even more than solid calories. 2. 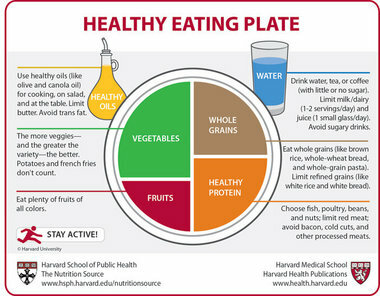 What are a “Healthy Eating Plate” and “Healthy Eating Pyramid”? This is the “Healthy Eating Plate”. It shows a picture of a plate and what size portions should be made up of vegetables (green), fruits (red), whole grains (brown), and healthy proteins (orange). 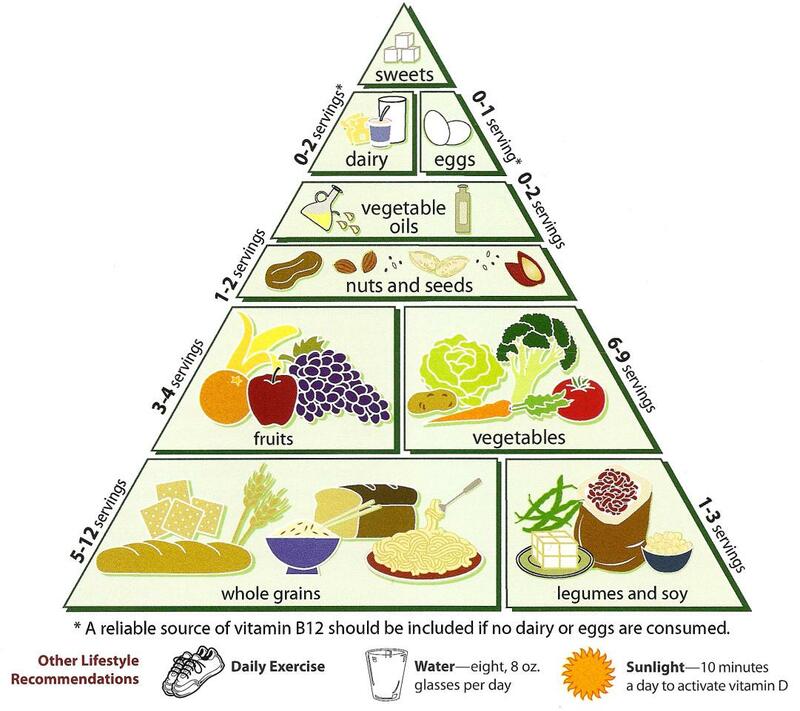 This is the “Healthy Eating Pyramid”. It shows all of the food groups, a representation of what is in each food group, and how much of each we should consume each day and that we should exorcise each day. 3. Which type of oil is best for cooking? 4. Should I take a vitamin? Multivitamins are used when people do not get enough vitamins from their food. If you have a well balanced diet rich in a variety of fruits, whole grains, lean meats, vegetables, and low fat dairy, you probably do not need a multivitamin. But, if your diet is not balanced or changes from day to day, you should take a multivitamin to fill the gaps left by your diet. Everyone should take a vitamin D supplement because it is not in much of our foods. 5. Why should I eat breakfast? Breakfast gives your brain fuel to help you concentrate and perform better at work and school. Breakfast essentially means breaking the overnight fast – helping you jump-start your metabolism for the day! Breakfast can help increase your overall energy. Breakfast helps keep your blood sugar level steady. Breakfast can help reduce the likelihood of overeating later in the day. 6. Why should I eat healthy? Eating a healthy balanced diet supplies essential vitamins and minerals that are necessary for good health. Eating Healthy can prevent illness and chronic diseases, adding years to your life span. 7. How much protein should I eat daily? 8. What is the difference between good and bad carbohydrates? 9. How many carbohydrates are necessary to maintain a healthy diet? Your total carbohydrates should total between 54-60% of your total calories for the day. You should select GOOD carbohydrates and try to stay away from the bad carbohydrates, as listed above. 10. How can I lower my cholesterol? When serving yourself a meal, use a salad plate instead of a dinner plate for portion control. Never skip meals! Eat at least 3 meals a day. Skipping meals can cause long-term health effects later, such as heart disease. Read food labels! Know what you and your family are consuming! A balanced diet will help you lose weight and keep it off much more so than a low carb or low fat diet. Carbs and fiber help you to feel fuller longer! Also, you will be able to continue this way of eating the rest of your life, where the low carb and low fat diets are for shorter periods of time. The most important thing remember in nutrition is that moderation and diversity are keys to any healthy diet. Do not exclude any single food group and do not eat too much of any one food. The best oil to use in cooking are: Canola oil, Olive oil, or Coconut oil because they are high in Unsaturated fats good fats) and low in saturated fats (bad fats).